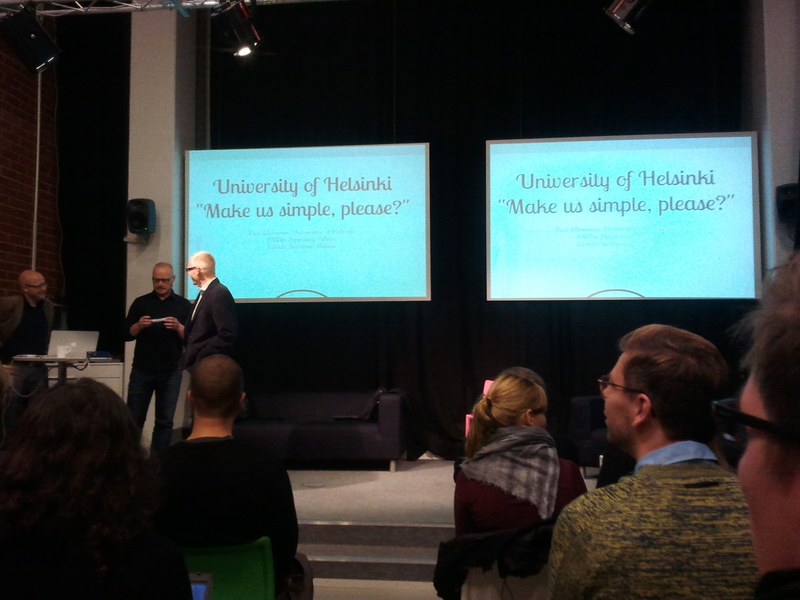 Mikko Jäppinen and Heikki Savonen, service designers from service design company Palmu Inc (along with Pasi Sihvonen from University of Helsinki) presented their latest project: “University of Helsinki, make us simple, please?” in Service design breakfast event in Start-up Sauna in Espoo, Finland. University of Helsinki had hired (after a public tender) Palmu to redesign their researchers’ administrative life. Pasi Sihvonen gave some background about the highly bureaucratic world that researchers have to live in order to get everything running. Pasi told that one day less admin work per project comes around 1,5 million euros savings per year. Competition with universities is tough and in order to keep up with the others they decided to start tackling this area. Heikki Savonen tells in detail what’s happening. Currently they’ve interviewed around 50 researchers, facilitated over 10 workshops. They’ve tried to dig in to deeper to heads of researchers. To see what the problems are – trying to find out what is working and what is not. Profiles have been created to understand behavior of different researchers. “Most challenging work was to get academic to be normal and try out and learn from try outs”, he says. Also communication about the project around the university has been challenging. Project is still ongoing but already they’ve received good results by co-designing a new way of working. They’ve started campaigns with interventions to get researchers to start administrative preparations earlier and to be informed better about the services available. They’ve used NPS scoring to measure the success. Already after one intervention they noticed that attitude towards faculty improved a lot and co-operation got better. Also they learned the working atmosphere had improved a lot in the faculty. They’ve identified lot of things needs to be changed in the future and that it’ll be taking much more time than anticipated. Evidence in the project success has already been shown and some pilots have already been scaled up to faculty level. Doing micro and then macro, Heikki concludes.